Once again we are carrying on our Christmas tradition of celebrating the twelve days of Christmas with Manitoba heritage images. In past years we have used churches. This year, for a change, we are sending out twelve Manitoba houses. Queen Anne Revival style houses dominate the list for their decorative nature and, somehow, they seem to suit the season. As ever, the pictures and descriptions are by Reid and Linda has included lines from her favourite yuletide tunes. 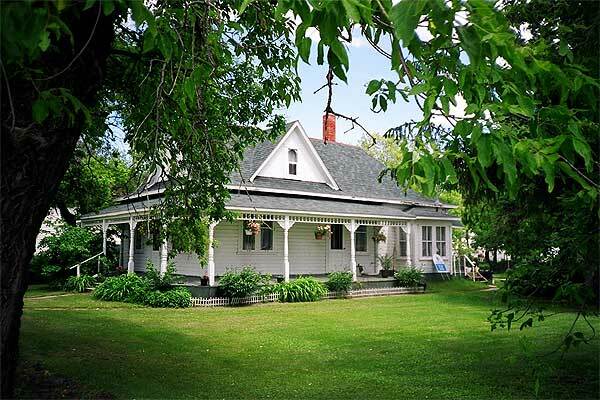 To accommodate the superintendent and his family, the Canadian Pacific Railway built this elegant wood frame two-and-a-half storey Queen Anne style house in 1901. 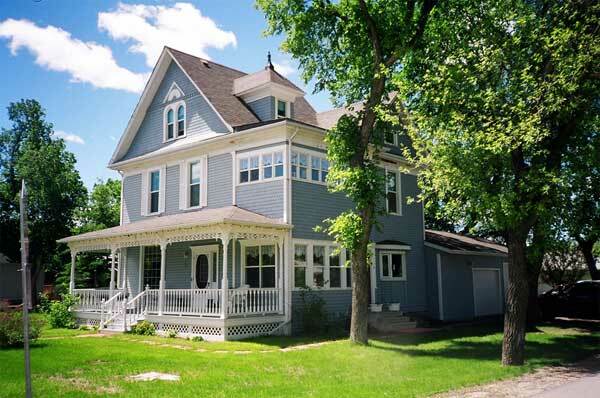 Set on a corner lot it displays a roofline cut with gables and peaked dormers, one with a stylish pinnacle. Under the gable, among fish scale shingling, two arched windows are topped with a spray and a gable angle signature. The colours are especially attractive. The striking verandah features delicate woodwork. This brick bungalow’s distinctive low-slung porch roof offers a deep sheltering space to enter the home. The whole building feels comfortably hunched against the sky. The landscaping, hedges, topiary and large evergreens on each side frame and complement the symmetry of the house, which is broken only by the chimney. The low-pitched dormer with its rafter tails and brackets replicates the pitch of the main roof giving lightness to the solid massing. Likely built in the 1920s, the fine red bricks have attained a sweet patina. 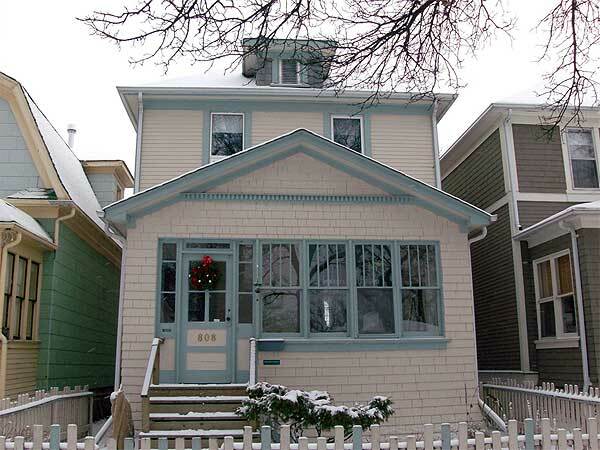 J. D. McLean, a tinsmith and hardware merchant, built this delightful two-storey Queen Anne style house about 1909. The masonry overall is exceptional with creative and contrasting brickwork all around. 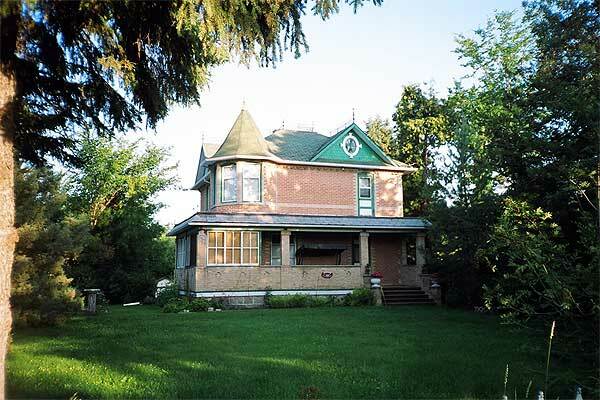 The major feature of the home is the fine corner turret with its many windows and a steep six-sided roof. Two gables with fish-scale shingling and bull’s eye windows balance the turret. The iron cresting along the roof ridges remains in good condition. Shoal Lake, by the way, is Reid’s hometown. 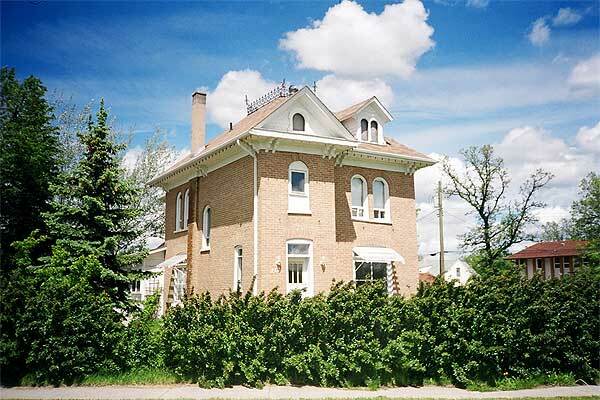 This eloquent two-storey Queen Anne style house demonstrates the early prosperity of Wawanesa. Executed in pale buff brick with sleek vertical massing, it features a variety of openings with small arches on the first floor and full arches on upper windows, gable and dormer. Paired brackets, slim chimney and metal cresting contribute to the effect. The shingle colour complements the pale brick. 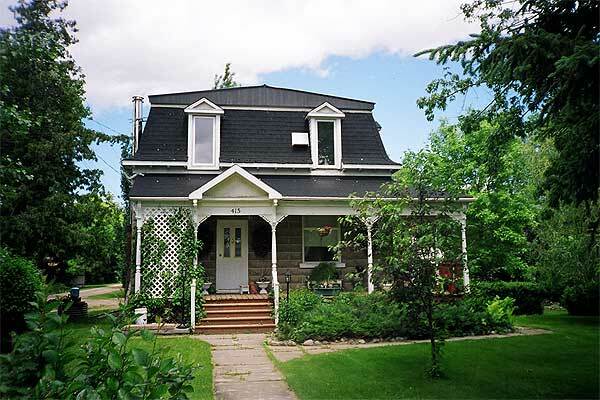 Well-kept and charming, this fine example of a mansard-roofed house was built around 1900. The house is constructed of concrete blocks, formed and scored to look like stone. This was a popular technique around this period when the blocks were made on site using a press. The delicate details on the verandah, striking colours and the setting make it enticing and rustic. Notice the pleasant interplay of the gables over the dormers and the one over the porch entry. 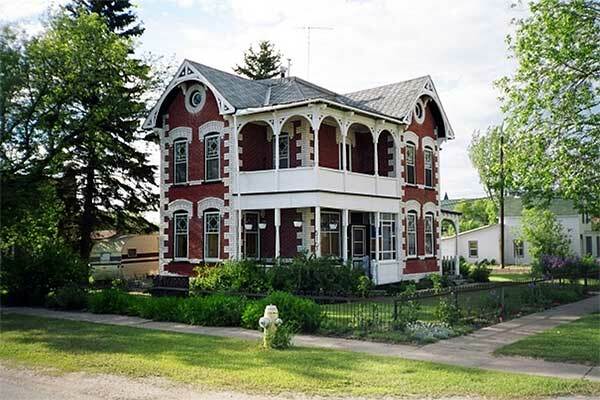 Other Manitoba towns with mansard-roofed houses include Oak Lake, Dunrea, Holland, Roland and Mariapolis. Built in 1914 when its west Fort Rouge neighbourhood was being developed, this standard off-centre entry, side staircase design is one of probably 20,000 similar houses in Winnipeg. Set on a thick fieldstone foundation, the house sports a full porch with substantial gable softened by a fine dentil. Contrasting with the inviting playfulness of the porch, the front elevation uses solid symmetry to move your attention to the dormer and beyond. One of the few remaining wooden picket fences in the area surrounds the front yard. The interior features an oak staircase, oak trim and hardwood floors. This is the house Linda and Reid call home. This house is a beauty! It is across the street from Home #1. 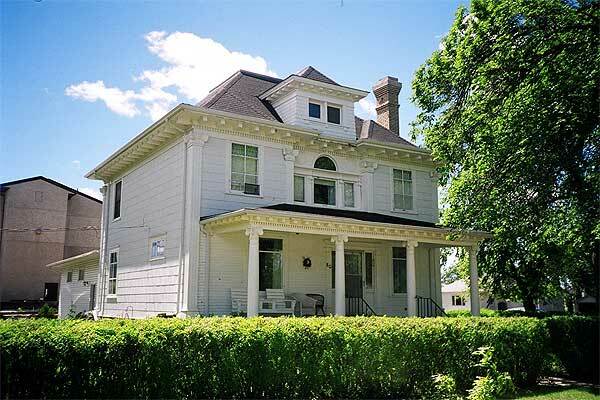 Built in 1909, architect Charles Hawkins Brindle loaded the house with Classical Revival elements. The massive front porch features heavy columns with Ionic capitals, flat brackets and dentil under its eaves and a low-pitched roof. The extended and hipped roof above the front corners suggests towers. Notice the sweet pitch of the roof and dormer. The brick chimney sports a chimneypot. Another lovely pridefully-maintained home in little Miami. 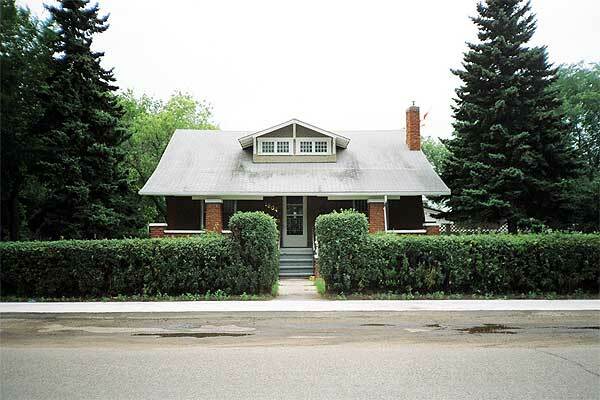 This classic example of a one and half storey bungalow with a beautiful open verandah sits contentedly in its well-preened yard among friendly mature trees. Take a few minutes the study this home. There is myriad of detail everywhere you look. The delicate turned spindles and the fine filigree brackets along the verandah roof crown turned posts. The shingling on the gable ends complements the window decoration. The patina of the red brick chimney sets off the whole affair. 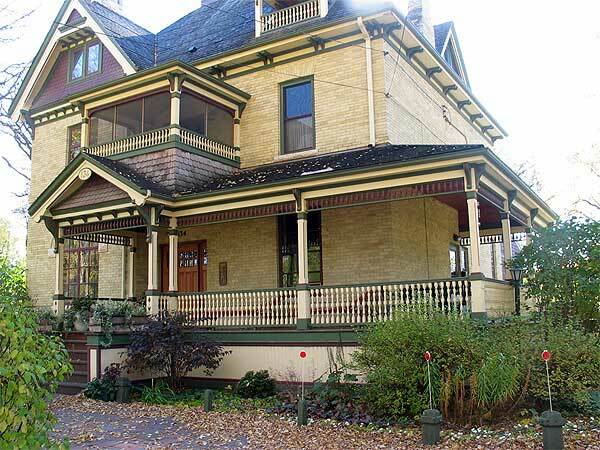 This splendid 1895 house exudes extreme Queen Anne style dripping with Eastlake decoration. The great opportunity of Eastlake style is unlimited decorative potential. The shaping of wood using basic hand tool technology – chisel, gouge and lathe – becomes fine art in the able hands of an imaginative artisan. The design invention and craft displayed on this house is a consummate delight to the senses. 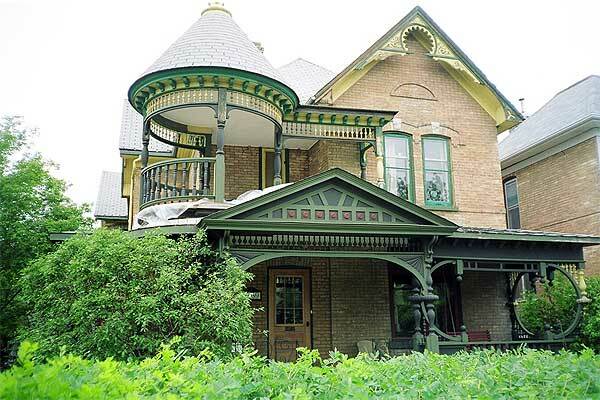 The first floor porch and the round balcony above dominate your attention. The upper balcony’s conical roof topped with the orbs and finial gives the roofline a fantasy feeling abetted by the rich colours and whimsical bargeboard designs on the gable ends. Take a moment to drink in the detail and the overall Seussian effect. The picturesque roofline features double gables with a shallow pitch between them. The flat section accommodates the basic W shape of the house. The two porches are exceptional. The arcade of arches with turned posts connects with the shape of the bargeboard and the arches over the windows. The colours are intoxicating. Notice the subtle use of black on the building. The encircled bull’s-eye windows are set perfectly between the brackets. Every corner is loaded with quoins. This remarkable place playfully incorporates several architectural styles to create a fanciful yet somehow formidable aura. A coin toss decided which gingerbread became Christmas Day house. Appropriately, this unusual place won. 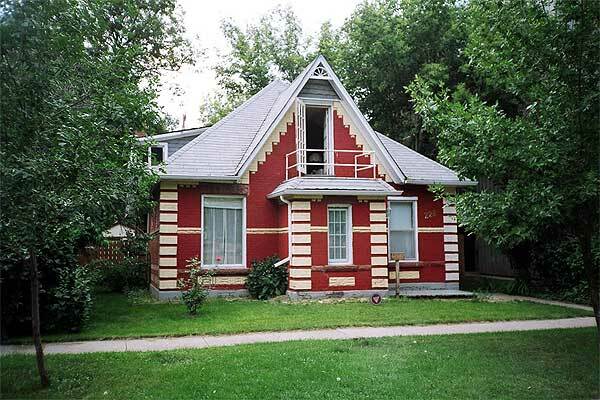 Built in 1893, it combines so many design elements that it feels weighed down by its own delight, covered up in aces. A classic gingerbread house, the roof has two large dormers that add some space to the upper floor. The front gable has a doorway that opens onto a tiny balcony. There is a nice bit of fret saw bargeboard under the gable tip. The cream details give heavy contrast to the candy apple red and the surrounding greenery which provide a festive feel. with painful steps and slow, Look now!